There will be helicopter, bus, boat and plane tours throughout the weekend, area lighthouses will be open. Climb to the top of the tower and gaze across the lake. Visit with lighthouse groups from all over the Great Lakes and beyond. Lots of lighthouse exhibits, vendors, food, music, dancing and dinner. Most events begin or take place at the Alpena Civic Center & Thunder Bay Recreation Center. All the booth displays will be at the Thunder Bay Center. Click below for the events calendar. Please check out the festival web site at the following, it provides a lot of information on the events and activities in the area and local museums. Conference Goal: Join us for the 10th anniversary meeting with a return to the first host site at Sleeping Bear Dunes National Lakeshore, Michigan. The focus of this workshop will be on developing a working model to prevent additional station losses by using the membership in organizing and implementing a quick response plan for threatened stations. The next ten years hold more difficult challenges as we see many more stations threatened by coastal development. Mark your calendars and plan on attending this milestone conference on one of the most beautiful coasts in Northern Michigan. Please register early to assist us in planning. Click here to go to the web site. From the beginning, Gull Rock’s exposed location has created challenges. Back in 1867 the original foreman hired to build the lighthouse died on the job, but despite that setback the light was successfully completed later that year. Since then the reefs and rocky shoals that surround Gull Rock have been the scene of several shipwrecks. The most famous wreck near Gull Rock was the 450-foot freighter L.C. Waldo, which ran aground on Nov. 8, 1913 near the lighthouse during a fierce storm packing 70 mph winds. But the waters in the vicinity of Gull Rock have been a threat to modern vessels as well. In December of 1989 the Coast Guard Cutter Mesquite ran aground near the tip of the Keweenaw Peninsula while buoy tending. For more information and lighthouse photos contact Peter Annin at Gull Rock Lightkeepers (608) 278-8005 www.gullrocklightkeepers.org or Jeff Shook at the Michigan Lighthouse Conservancy (810) 750-9236 www.michiganlights.com . Please view the Tawas page on this exciting news. You may find it by clicking here. The Tawas Life Saving Station will be lost in the near future. The land developer has plans to tear the buildings down before the end of January 2005. Not receiving enough funding to move the buildings or dismantle them the Michigan Lighthouse Conservancy will not be able to save the buildings. Private investors were also sought to purchase the property from the land developer but no agreements on a selling price could be reached. In order to preserve the stations memory, MLC has hired UP Engineers & Architects out of Marquette Michigan to produce a complete a set of drawings for the buildings as they exist now. These copies will serve as one of the last reminders of the station. They will be kept in paper and electronic form for anyone wanting to view them in the future who researches the Tawas Station. Copies will also be offered to the National Archives and the State of Michigan Archives as well for preservation. Unfortunately not enough time and money existed to save this station, but let it serve us as a reminder of how some people in our society let historic properties like this and some lighthouse meet the wrecking ball. Let us hope we learn our lessons so we may prevent this from happening in the future. The Michigan Lighthouse Conservancy and Gull Rock Lightkeepers, both 501(c)3 nonprofit organizations in the State of Michigan, have submitted an application to acquire the Gull Rock Lighthouse located off the tip of the Keweenaw Peninsula of Michigan, near Copper Harbor. The Michigan Lighthouse Conservancy is dedicated to helping preserve and promoting the preservation of Michigan’s lighthouses and life saving stations, which are from the pre-Coast Guard era. Gull Rock Lighthkeepers is dedicated strictly to the preservation of the Gull Rock Lighthouse. The Michigan Lighthouse Conservancy and Gull Rock Lightkeepers have joined together to help save the Gull Rock lighthouse. An application was submitted to the National Park Service (NPS) for their review. The lighthouse was applied for under the National Lighthouse Preservation Act of 2000 (NLHPA 2000). The application was submitted to the NPS back in September of 2004. NPS returned the application requiring some clarification in four areas. These questions have been answered and the application returned to NPS for final review just before the Christmas holiday in 2004. We are assuming about a three to four month time period of review for the application. No other applicants existed for to save this light station. If NPS approves the application, we expect it to be transferred to the Michigan Lighthouse Conservancy and Gull Rock Lightkeepers sometime this summer. Gull Rock Lightkeepers is a local organization and will be taking the lead role in the light station restoration. 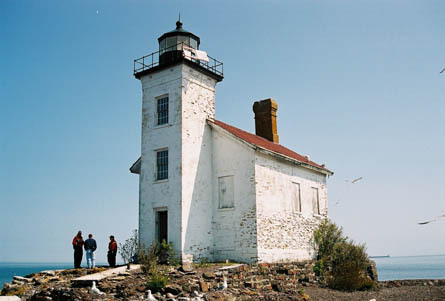 Michigan Lighthouse Conservancy will be helping the lightkeepers with restoration experience, resources and promoting public awareness of the station. Michigan Lighthouse Conservancy and Gull Rock Lightkeepers are actively seeking financial support for restoration of this light station. It is one of the worst damaged lighthouses in the Great Lakes and may be at the top of the list. Please send any financial contributions in as they all will help. Please mark funds “Gull Rock”. You may reach either organization for questions or donations at the addresses below. Michigan Lighthouse Conservancy, P.O. Box 973, Fenton, MI. 48430 or by telephone at (810) 750-9236. Seventeen years after the publication of their first book "Living at a lighthouse," in 1987, the Great Lakes Lighthouse Keepers Association has published a second book of oral histories of USLHE and USCG keepers and their children titled "Reliving Lighthouse Memories." Profusely illustrated and edited by GLLKA Straits Coordinator Sandy Planisek, the 200-page book features fascinating and insightful stories in the words of those who lived the experiences. MLC highly recommends this book as a valuable tool for anyone interested in Great Lakes history. The book is very reasonably priced at only $13.95, with all proceeds going to help fund the association's restoration and education programs. To order a copy, contact the GLLKA office at (231) 436-5580.